This designer collection includes 10 spools of 50wt. 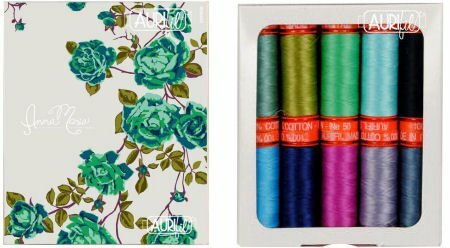 premium cotton thread curated by Anna Maria Horner and designed specifically to coordinate with her fabrics. Spools are 220 yards (200 meters) each and are 100% cotton. Made in Italy. Includes colors 2692, 1158, 6733, 2535, 2745, 1320, 5006, 2850, 2860, and 5016.